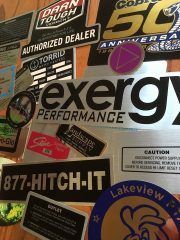 Custom stickers and decals for outdoor use are most commonly printed on white vinyl or a clear polyester. But, often overlooked as an attractive and durable alternative are chrome stickers. They are available for custom printing in three styles: Mirror Finish Chrome Polyester, Brushed Chrome Polyester, and Gold Polyester. These three styles are commonly used for equipment labeling, warning labels, authorized dealer stickers, badges and any other time a more metallic contemporary finish is desired. For promotional decals the chrome can compliment retro designs or offer a more high end or elegant appearance. Physically, these polyesters are very “dimensionally stable” and do not stretch or shrink. They are very suitable for outdoor uses and are very resistant to chemicals. Due to their lack of flexibility these polyesters are not suitable for curved or irregular surfaces. Websticker is happy to advise if a chrome polyester material is right for your project, offer new possible eye catching designs, or offer any price comparisons you might need. 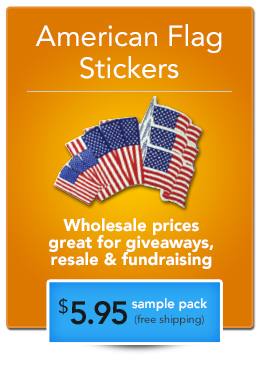 Contact us today and let us help you bring your stickers up to the next level.